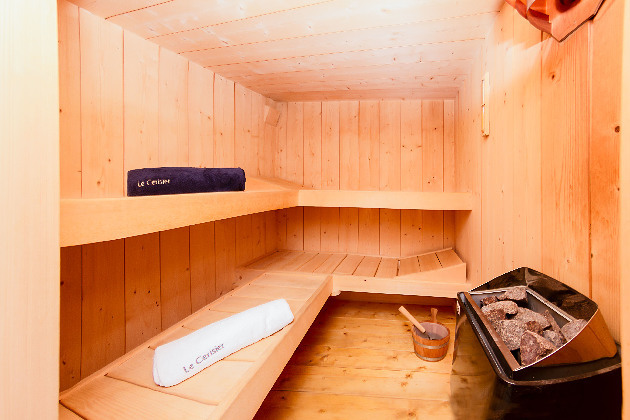 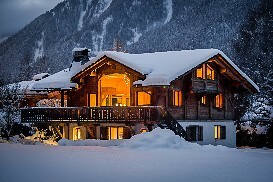 Only a one minute drive from the Flegere lift station and 4-minutes from Chamonix town centre it has an ideal position. 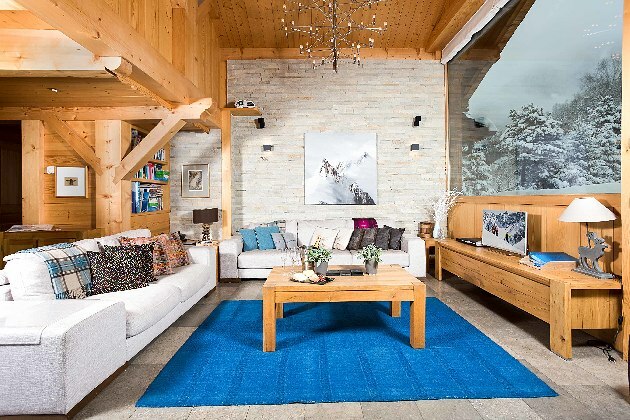 It has been furnished and equipped to the highest standards, combining modern living with comfort and maximum attention to capturing the beauty of its dramatic natural setting. 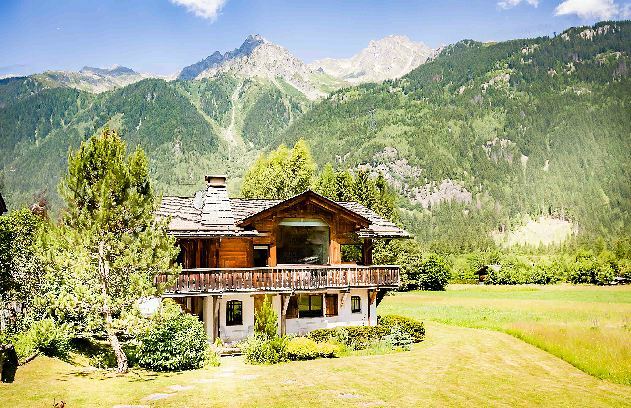 Chalet Calista has been designed in traditional Alpine style and is built to meet the needs of the more discerning alpine visitor. 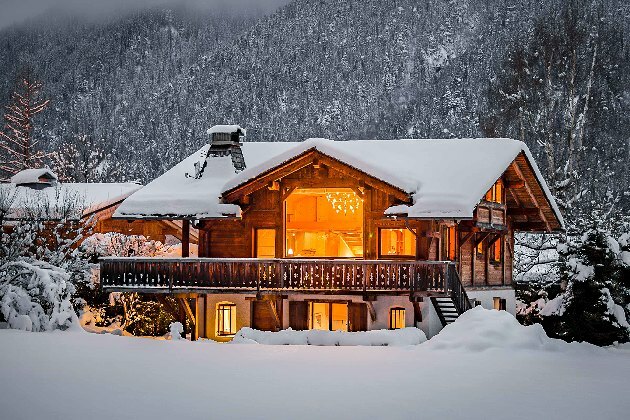 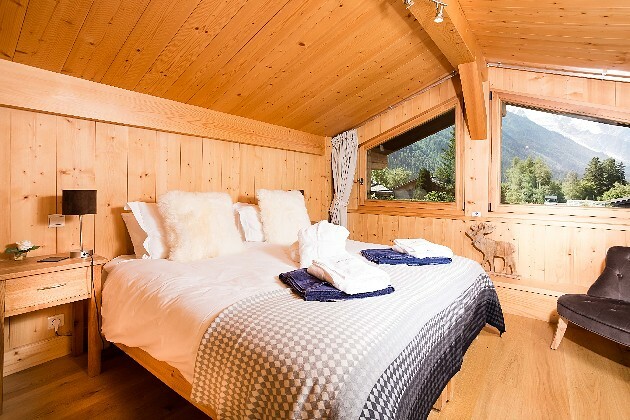 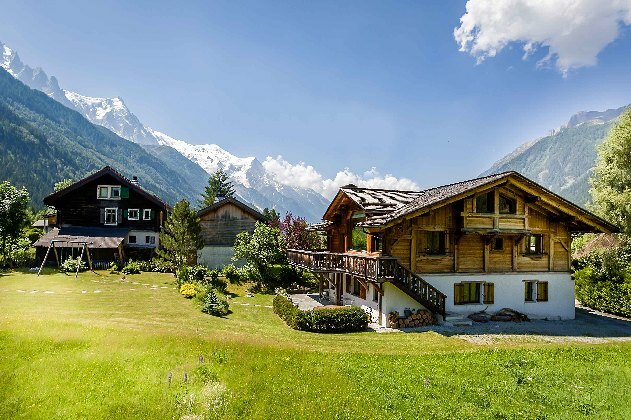 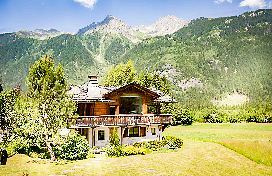 In the heart of Les Bois, the centre of the Chamonix valley, it is at once both secluded and in perfect proximity to ski lifts, to summer trails, to the golf course and to Chamonix town. Sleeping ten across three floors, every room is designed to accentuate light and space. 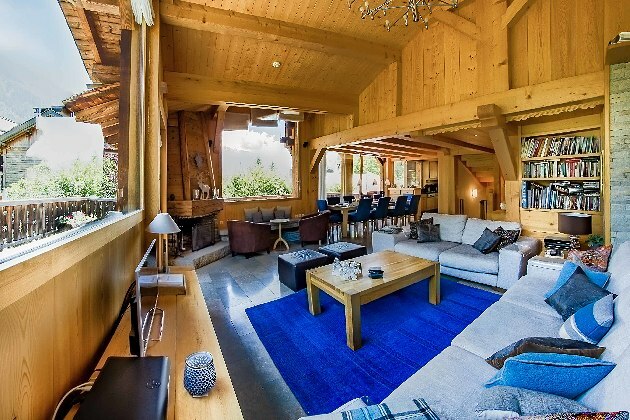 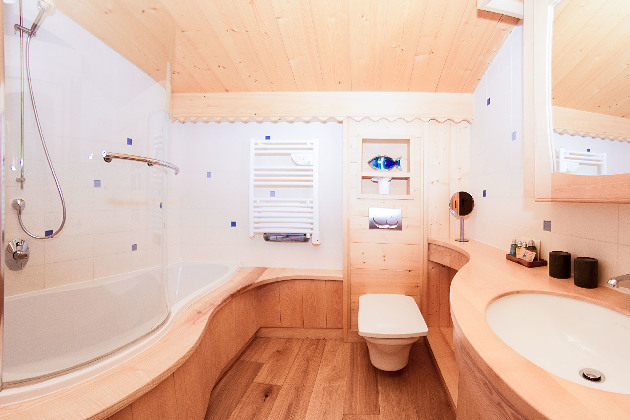 The chalet is built mainly from wood, with traditional Alpine joints in the massive beams. However the feel is modern, with polished stone and wood floors and the massive windows. 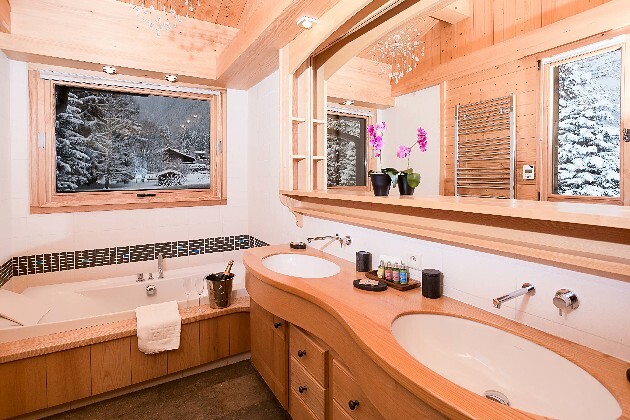 Modern technology is used throughout, from the geothermal heating and insulation to the kitchen and entertainment systems. 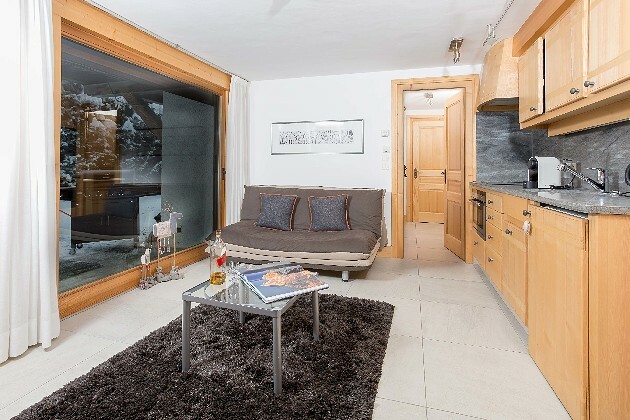 The living area is on the first floor to take full advantage of the views and to make maximum use of the massive balcony. There are sofas and armchairs for the entire party, an open log fire, a Bose entertainment system and Sky TV, with a drop-down projection screen for late night DVDs - all of it under one of the largest windows you are ever likely to see, with what is perhaps one of Chamonix's most striking and unusual views: looking straight up at the twin peaks of Les Drus. 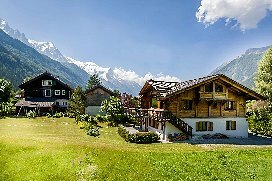 Mont Blanc itself dominates the view down the valley. 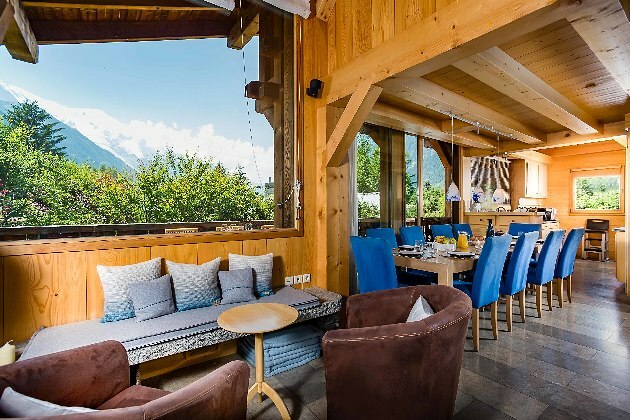 The chalet's dining space is adjacent. Right next to the kitchen area, the broad and solid wooden table seats 10 with plenty of elbow room. The kitchen is beautifully constructed from wood and granite, with Siemens ovens and induction hob. 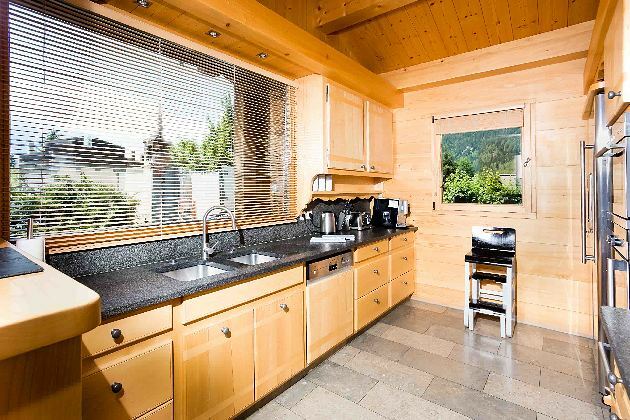 There is also a large American fridge-freezer and of course a dishwasher. 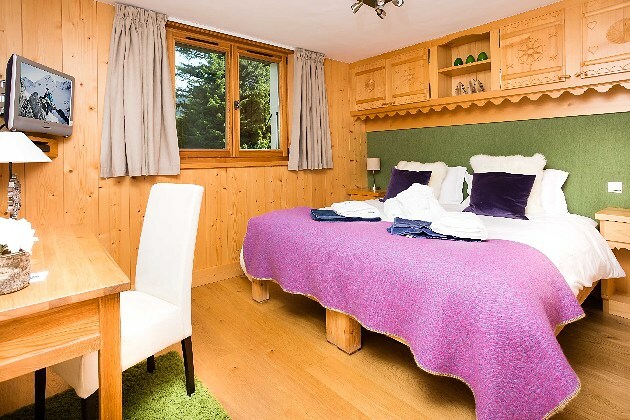 A fully equipped laundry is downstairs, with washing machine and dryer. 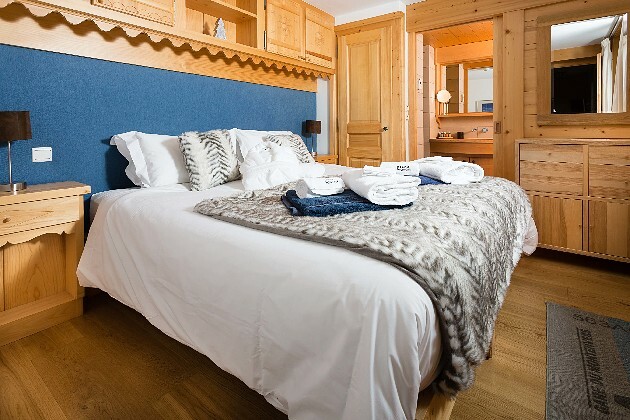 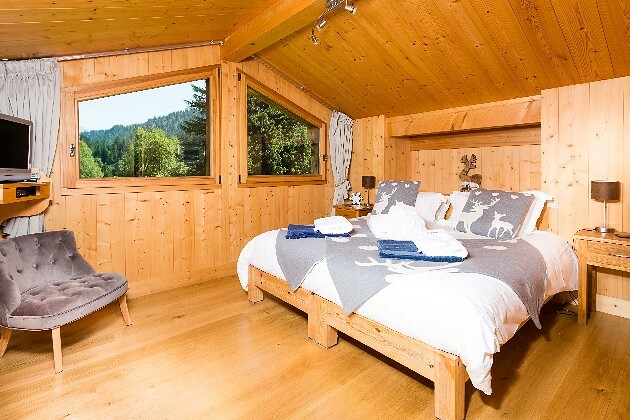 The bedrooms are as airy and spacious as the rest of the chalet; our intent when building Calista was to create a feeling of relaxation throughout, and you will find no clutter and nothing squeezed into corners. 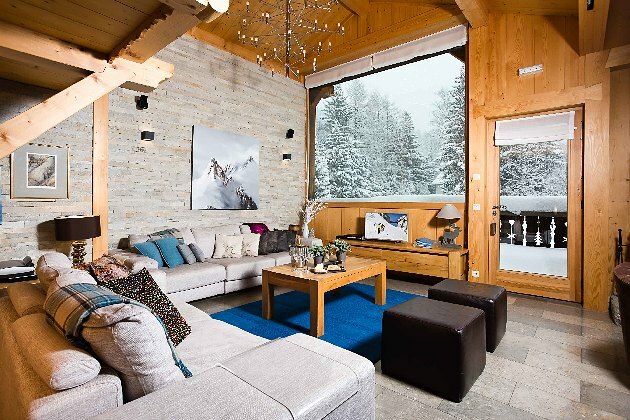 Light wood, large windows, satellite television are standard to every room. The master suite is on the first floor with its own walk-through dressing room to the fabulous bathroom. 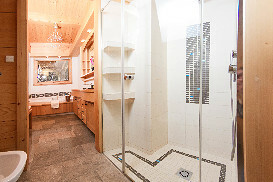 Two bedrooms and two bathrooms are on the level above, one with bath and shower and one with shower. 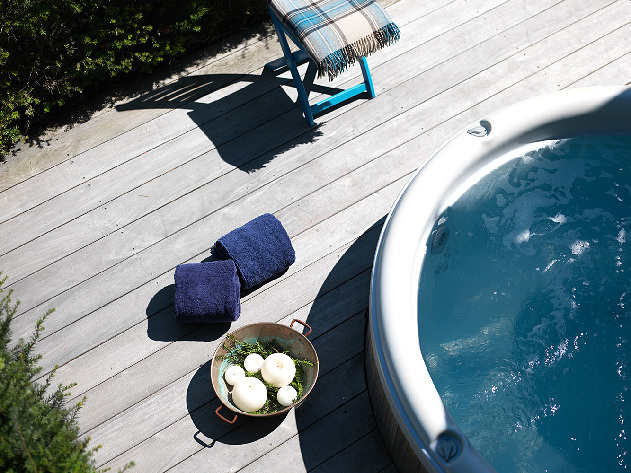 Two further bedrooms are on the ground floor, both with en-suite shower rooms and one with an adjoining studio living room, which opens out into the terrace and garden. All the bedrooms can be made up as either double or twin beds. The 6 person sauna is downstairs. 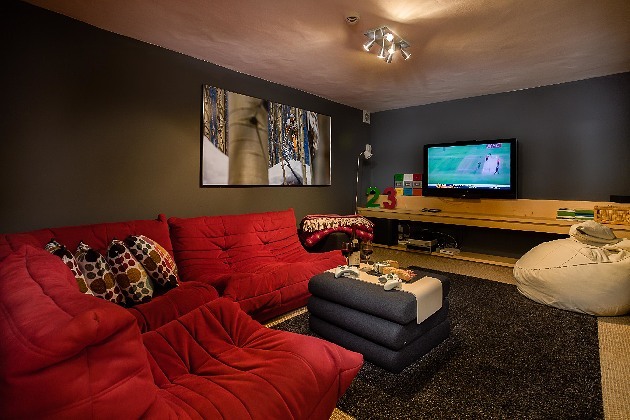 Also on the lower floor is a snug, which can also be a playroom for the kids with the X-Box 360 or Nintendo Wii, or a quiet and intimate space for watching a film. 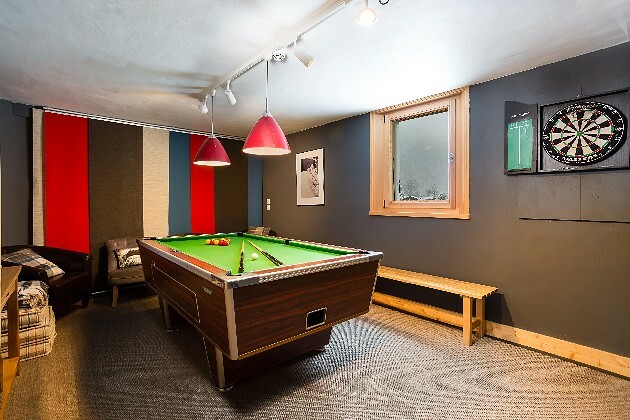 There is also a games room with a proper pool table and a darts board. 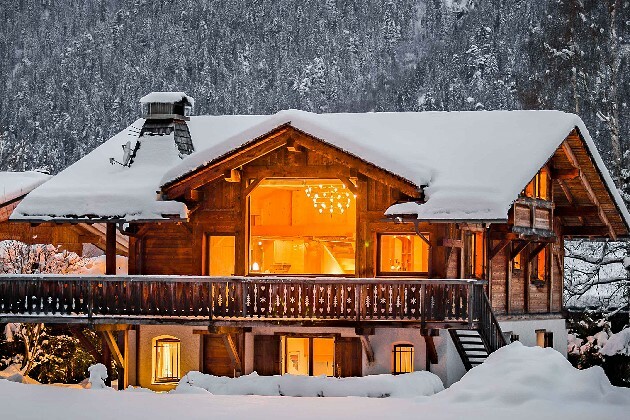 The exterior of Chalet Calista is just as strikingly spacious as its interior. 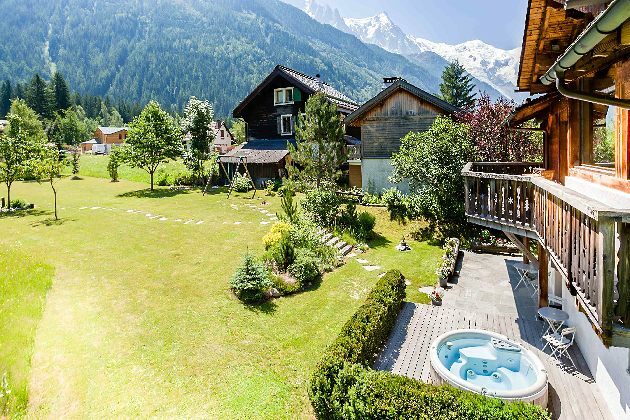 The wrap-around balcony has tables, chairs and enough room for an outdoor dinner when the weather permits; the enormous garden is bordered by open fields and gentle woodland, and unusually for Chamonix, it is flat: perfect for snowman building and in the summer there's plenty of room for an impromptu game of cricket. 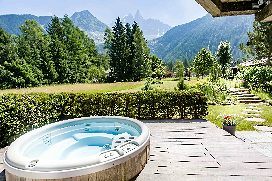 From the outdoor hot tub, you can see the huge garden or the awe-inspiring sight of Les Drus towering above you. Rental can be on a self-catered basis, but any level of catering can be provided according to your requirements. 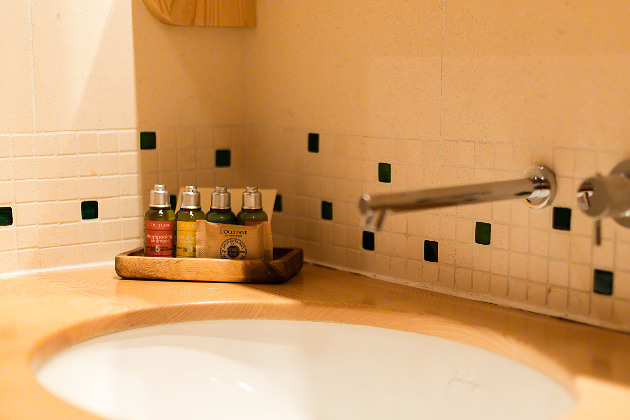 We use a professional chef, and employ a housekeeper as standard. 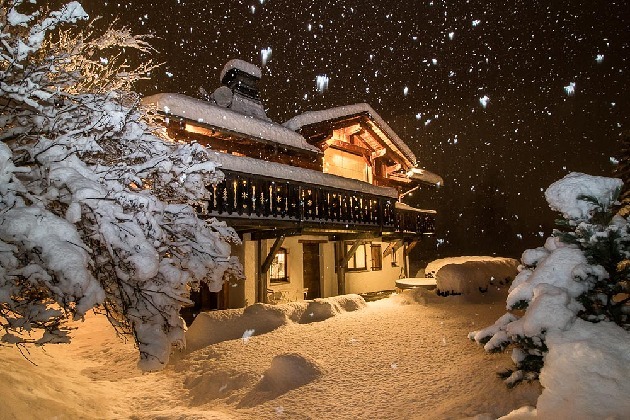 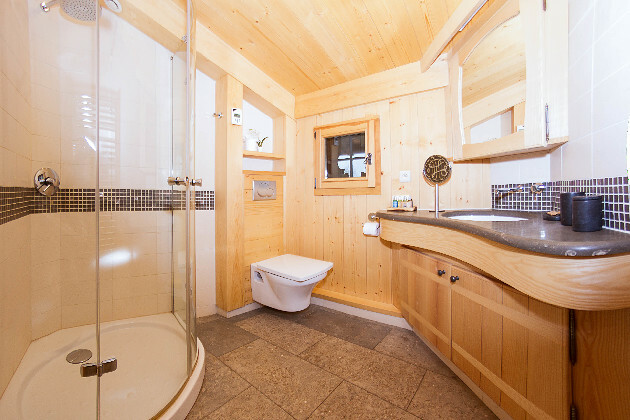 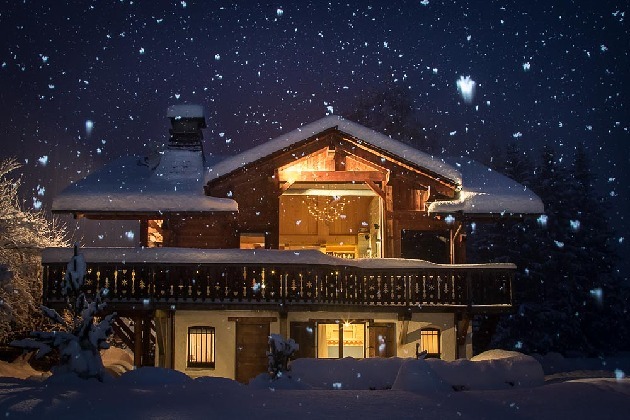 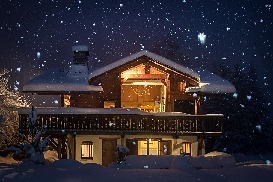 Click for Prices and Availability for Chalet Calista now. 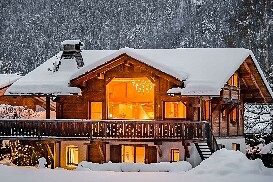 Large south facing balcony and terrace with sun loungers. Prices listed are for self catered, for up to 10 people. All linens and towels provided, as well as luxury bathroom products. 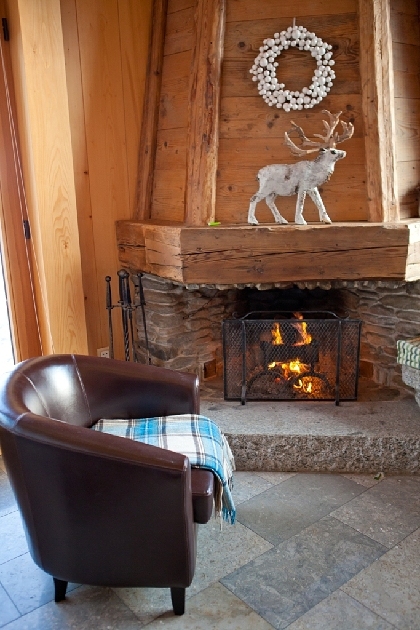 Wifi and unlimited firewood also provided at no extra charge. 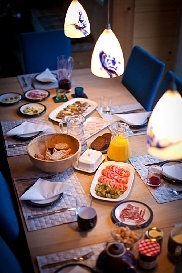 Catered prices on request, but allow approximately €2,500 per week in addition to self catered prices, plus cost of food ingredients and drink. Pets allowed under certain circumstances. Please ask ahead of booking.